Health organizations across the United States have jumped onto the population health management bandwagon striving to provide efficient care management services while lowering plan members’ health risks and costs. The desire to identify members with modifiable risks — while aligning care management services to fit the population’s needs — is pushing healthcare organizations toward advanced data management platforms, migrating to data-supported care management programs. Deerwalk’s integrated healthcare data platform, driven by its Plan Analytics and Care Manager products for care management personnel, is designed to support these evolving needs. Building a successful population health platform is not an easy task. The platform must be based on technology that skillfully handles the complexity of healthcare data and easily integrates with other systems. Integration of data collected from diverse sources must appear seamlessly to the end user. The platform must merge traditional data like medical and pharmacy claims with new sources of information such as lab results, observed and self-reported member behaviors, and social determinants. The data must be retained over time — a minimum of 3 years and preferably 5 to 10 years at the member level. The platform must be readily scalable to accommodate this quantity of stored data. The platform provider must comply with confidentiality and industry-standard security regulations. provide cost-effective care for members. Effective care management depends on easily accessible, real-time, actionable member data, but having the data available does not necessarily ensure that an organization’s population health strategies will correctly align with the real needs of the population. There is no single value-based population management model that fits for all organizations. Each organization likely has set-up their own care management process. Managing the changes in that process can be vexing. Real-time data integration is particularly critical in intra-organization logistics, breaking down the silos of care many healthcare providers are used to. Care managers must go beyond what they individually see and hear. They will have to learn from the data coming from other sources. They must trust rules-driven conclusions that can only be seen after merging the various healthcare events. The organization must consider training needs and organizational support for care managers as they move forward in the transition from traditional workflows to ones driven by an integrated data platform. But the change-management load can be significantly reduced when the integrated data platform harmonizes differences in silo-generated workflows, with user interfaces that all care providers can understand. Deerwalk built its platform to meet those goals. To provide care to a member – at any point in the healthcare continuum – care managers must be presented with a single, comprehensive picture of the member’s current and historical health status. This singular view allows for improved coordination of care for the member, reduced duplication of services, and better overall outcomes. Using Deerwalk’s Care Manager interface, each care manager – health coach, care coordinator, utilization management nurse or case manager – works from the same member record. Care Manager allows all to see what is happening with the member and coordinate their goals and interventions. The result is improved health-related decision making for members and enhanced clinical outcomes, both of which help to maintain or lower healthcare costs for the organization. Care Manager users enter member information – vital signs, lab results, program enrollment, etc. – which is looped back into the Deerwalk integrated data platform and made available for reporting quality, outcomes, and trends. The platform generates alerts for out-of-range tests, gaps in care quality, and potentially avoidable ER visits or hospital admissions, flagged at the member level and presented to the user for follow-on actions. Limited staffing and financial resources present significant challenges to efficient and effective care management. Integrating data can reduce those challenges. 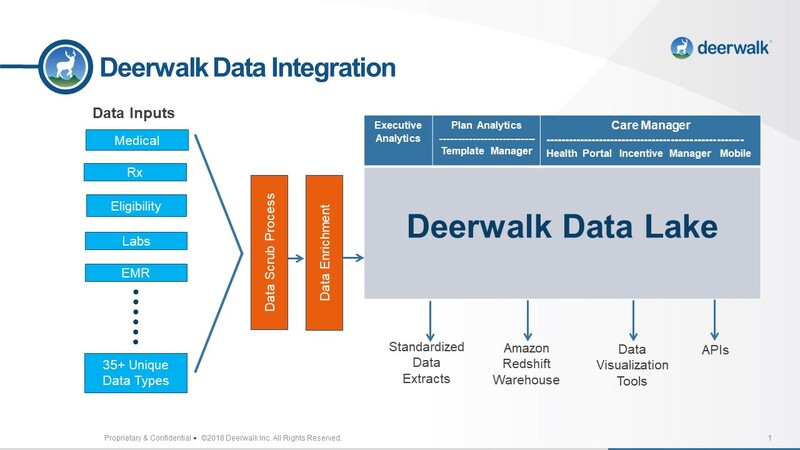 Using the Deerwalk integrated platform’s output as a guide, an organization can review the steps in its care-management process and eliminate any that the data-driven platform can automate. For example, there will be no continuing need to scour through reports reviewing claims for specific trigger diagnoses or procedures. Deerwalk’s platform automatically creates lists of members who meet the trigger criteria and loads those members into Care Manager queues or caseloads. Enhanced screening is possible through Care Manager’s integration with Deerwalk’s Plan Analytics product, which provides clinical and financial information reporting and analysis. Care Manager users can screen the Plan Analytics triggered members for inclusion in a cohort, or pre-defined criteria can automatically narrow the Care Manager list. Care Manager can automatically create program referrals and tasks for the identified members eliminating the manual steps now performed by care managers. The result of removing unnecessary steps is much less fragmentation of care, the ability to focus on those interventions that members feel are of value, and better overall flow of care management services to the member. Healthcare organizations need to rely on data management platforms – and products like Plan Analytics and Care Manager – to support their population health management and outcome-based care management strategies. Deerwalk’s platform provides greater transparency for healthcare organizations to track trends in disease/condition management. It identifies whether appropriate services were available to the right members at the right time. And it allows organizations the ability to evaluate the effectiveness of preventive measures and cost-effective care for its members. To contact a Deerwalk representative to learn more about our Plan Analytics and Care Manager solutions and schedule a demo, click below.